Published: May 27, 2015 at 12:14 p.m. Updated: May 27, 2015 at 12:23 p.m.
CFB 24/7's "15 for '15" series continues with an eye toward one of the more tradition-rich aspects of college football by taking a look at the top mascots from around the country. Slightly strange look? 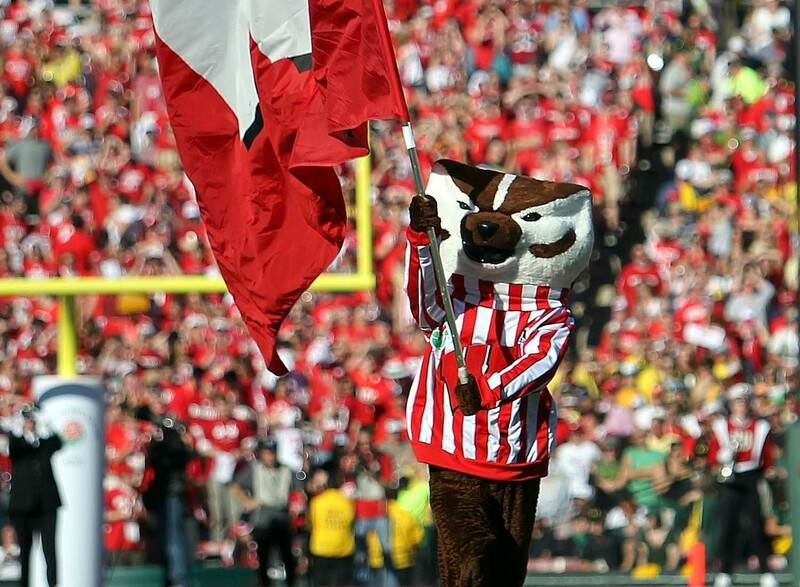 Sure, but Bucky makes up for that by being one of the more recognizable mascots around the tradition-rich Big Ten. He's got plenty of energy no matter what sporting event he's at, and his use of humor is top notch. The tradition of the Masked Rider dates back to 1937 for Texas Tech and draws upon plenty of older rituals from the area going back even further. History aside, whomever is the mascot (bonus points for progressively allowing a woman to be the mascot in the 1970s) still gets to ride a beautiful black horse in an awesome outfit that includes a cape. Miami (Fla.) football players running out of the tunnel in a cloud of smoke is among the most recognizable entrances in college football, and right there with them is the easily spotted Sebastian the Ibis. The bird has plenty of swagger, good moves and has been more of an attraction than some Hurricanes football teams lately. Plus he gets to live on South Beach. Live mascots are always a plus, and it's hard to go wrong with a giant namesake that is instantly identifiable. Bevo is much calmer than many Longhorns fans on game day, and counts those like Matthew McConaughey among those who are close friends. Not to mention, how many others on this list have been to a presidential inauguration like Bevo XIV did when George W. Bush was sworn in? Ok, not the true official mascot of Stanford, but it's close enough to count since it is a member of The Leland Stanford Junior University Marching Band. The design changes from year to year, which is a plus, and nobody else on this list is more closely associated with the area the school is located in terms of both the outward-facing look and the extremely quirky nature of its actions. Getting banned from various functions due to past incidents probably enhances its reputation. He's got a coonskin cap and a gunpowder rifle, which he does get to actually fire quite a bit. In terms of assuming the mythology of a mascot, it's hard to top whoever is selected as that year's Mountaineer in terms of fun. Auburn's official mascot forms a potent one-two punch with the closely associated War Eagle to provide plenty of entertainment and inspiration at Auburn events. He's won several national awards and is a constant source of laughs, school spirit and all-around fun. Being loved by both kids and adults equally is truly a skill few have in the mascot community. As if leading the famous Florida State War Chant isn't cool enough, the Seminole gets to ride atop the majestic Renegade and launch a flaming spear at midfield. Not bad at all. Think it's just the big schools who have a place on this list? Think again. The well-recognized face of Division II powerhouse Pittsburg State, Gus does just about everything you expect from your typical mascot but amps up the energy and pizazz. Wearing a football jersey and cool sunglasses helps plenty. There are few things cooler in college football than Ralphie running onto the football field surrounded by her handlers. There's speed, there's grace and there's even the occasional sidekick who hits the turf after not being able to keep up with Colorado's fantastic live mascot. The English Bulldog in a red jersey has a lockdown on being one of the cutest mascots around. There is no denying the charm he brings at the southern institution, especially on game days. Sure, Uga might not be the most exciting mascot in terms of rah-rah, fire-you-up attitude, but the dog makes it up in other areas. There are few mascots as majestic as Texas A&M's official mascot, and at a school where tradition is forefront in just about every aspect of university life, few things are held more dear than the elegant collie. Reveille is the highest-ranking member of the Aggies' Corps of Cadets and famously is able to dismiss a class entirely if she barks during the session. Not only is the bengal tiger one of -- if not the -- most impressive live animal mascots to look at in the country, but his multi-million dollar home on campus is one of the nicest pads around (a closet in the stadium it isn't). Let's face it, having a giant tiger roaming around is a pretty good show of strength for any team. Brutus is one of the more recognizable mascots in the country, and for good reason. Not only has Ohio State been winning impressively on the field, but Brutus' antics off of it have garnered plenty of attention. He's got plenty of energy, a great sense of humor and seems to be a regular at big-time events around college football. Not bad for a giant nut. Few mascots have adopted technology as adeptly as The Duck has, mastering everything from Twitter to Tinder (yep) to the art of the viral video over the past few years to go from cute, Disney-inspired character to regular internet sensation. It's not all about the entertaining though, as he does pushups whenever the football team scores -- which is quite a bit ever since Chip Kelly first installed his offense in Eugene. The bottom line is you don't want to mess with The Duck because if you come at the king, you best not miss.